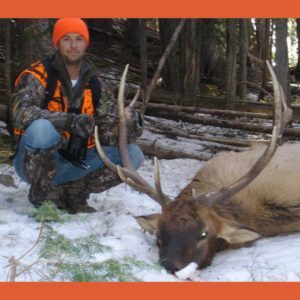 Action Adventures is home to numerous big game hunting opportunities. One of these is to hunt one of our private ranches. These are not high fence ranches. These are high country acreages home to some great elk and mule deer. Low pressure and quality management gives private land hunters an added edge in harvesting a quality animal. 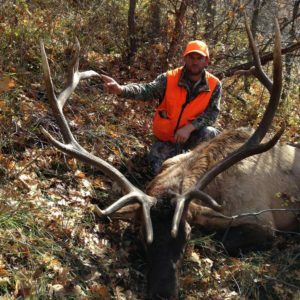 We offer private land hunts in both over-the-counter units as well as limited draw units. Below are some of our great private land hunting packages. We are once again offering private land drop camps on the Quarter Circle HM Ranch. This hunt includes comfortable bunkhouse with beds, separate cooking cabin with dining and lounge area. Solar and generated electricity, hot and cold running water, shower, TV, all the comforts of home in a wilderness setting. Private lake boasts trophy trout for when you want to take a break from hunting. Ground blinds and tree-stands preset over water holes, and feeding areas. The ranch also borders a roadless portion of National Forest. 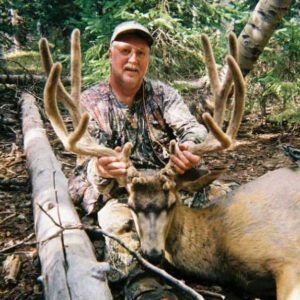 There are boundless acres to hunt and it boasts very good numbers of elk, mule deer and black bear. If you have four or more in your group you will have the ranch to yourself. 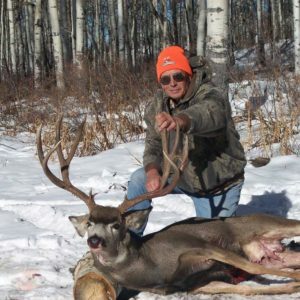 This is one of the best combination elk and deer hunts you will find. There are also a large number of black bears in the early seasons. This productive ranch is completely behind locked gates. This hunt is a hybrid of a guided hunt and a drop camp. You are provided with lodging, two home cooked meals, along with a sack lunch each day, pack horses, and a guide in camp to show you the ranch, plus GPS coordinates of the best spots. This hunt allows you the freedom of a drop camp, to hunt on your own without all the cooking and camp chores. 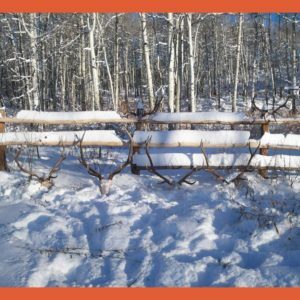 You will hunt out of our private ranch that also accesses several thousand acres of roadless National Forest. The lower end of the ranch adjoins a remote state wildlife area. All you have to do is concentrate on bagging that big bull. You are outfitted with everything you need to have a successful hunt. 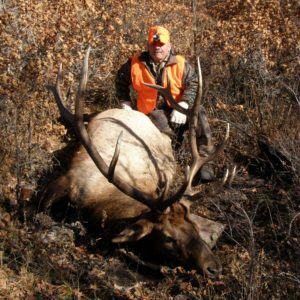 If you like the challenge of elk hunting on your own with all the extras of a full service hunt without the high price tag, this is the one for you. Comparable guided hunts would run in excess of $5,000. These are great hunts for the veteran hunter and novice alike. You will have a comfortable cabin to stay in and the finest in home cooked meals. Anyone filling their tags early can fish for rainbows and brookies in our private lake. The ranch can be reached by 4WD, and provides a great opportunity for those that can’t get around like they used to. There are miles of roadless forest for those wanting to hunt this remote unspoiled area.